UPDATE: The Dalai Lama's trip to Albany NY has been canceled. ALBANY NY - The Dalai Lama will speak at the Times Union Center on April 19, 2009 as part of The World Ethical Foundations Consortium's first formal gathering in Albany, from April 18 - 22. 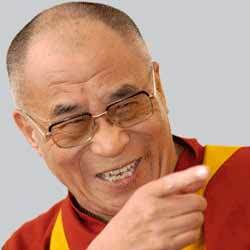 It will mark the Dalai Lama's first appearance in the Capital Region. During this inaugural event, His Holiness the Dalai Lama will deliver a public address, and specialized panels uniting world-renown experts, leaders and dignitaries will be held. There is also expected to be entertainment lined up for the event. The 14th Dalai Lama is 73-year-old Tenzin Gyatso, who won a Nobel Peace Prize in 1989 for his efforts to resolve Tibetan conflicts with China. He is the head of state and spiritual leader of Buddhism in Tibet, in addition to being a world-renowned symbol of peace and spirituality. In addition to his appearance at the Times Union Center, The Dalai Lama is also scheduled to speak at the University At Albany for World Ethical Foundations Consortium (WEFC) inaugural events that weekend. It has yet to be decided whether the events will be open to the campus only or the community at large. Skidmore College and Rensselaer Polytechnic Institute (RPI) had declined to make their facilities available for WEFC events that would have featured the Dalai Lama. The WEFC is self described as "a highly directed initiative promoting the understanding and application of compassionate ethics in the world community." The Consortium was formed in August 2008 by Keith Raniere and cofounded by sisters Sara and Clare Bronfman. Clare Bronfman is also a trustee of the Ethical Humanitarian Foundation. Raniere is the founder of Nxivm, a Colonie-based company that offers regular training seminars known as Executive Success Programs. Since its emergence in 1998, Nxivm has garnered a great deal of negative publicity, charged with being "cult-like" by former members and investigators. The organization denies these claims. Tickets to see the Dalai Lama on April 19 are on sale at the Times Union Center box office, the Times Union website, select Price Chopper outlets or 1-800-30-EVENT. For more information, visit the WEFC website or email them.